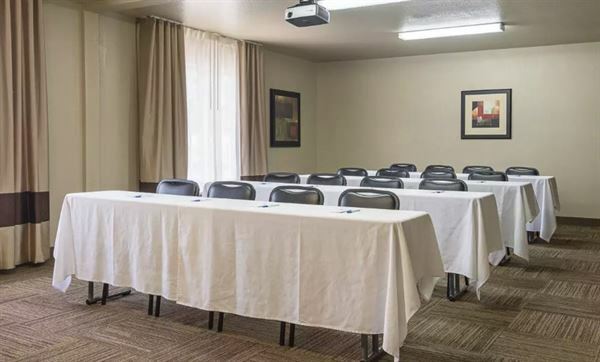 Our Bentonville conference accommodations offers more than 1,400 square feet of meeting space that’s just right for your next important function. Flexible enough to meet a variety of needs, we can configure the area to meet your needs. We also have everything you need to make your event great, including relaxing accommodations for any overnight guests. The rooms are large, attractive, and comfortable. The staff is efficient, thoughtful, and very helpful. A perfect hotel for visitors to northwest Arkansas. I am so glad we know about it!! Special Features: Lounge/ Bar, Complimentary Hot Buffet Breakfast - Daily. Indoor Pool and Hot Tub. 24-Hour Business Center and Fitness Center.